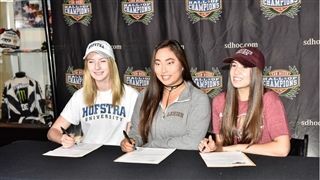 Congratulations to Pacific Ridge student-athletes Emma Price, Ava Embry and Angela Ding, who signed National Letters of Intent last week. Emma committed to continuing her volleyball career playing D1 ball for Hofstra University, while Ava will also be contributing her volleyball skills to the D1 LaFayette College program. Angela will be rounding out a strong Lehigh University womens golf team. These standout Firebirds will become Lions, Leopards and Hawks, respectively, so their opponents better watch out!